Contact Author - Mrs. D.
Trailer - Good Morning, World! Mrs. D. (Olga D’Agostino), an award-winning author, grew up in western Ukraine as the daughter of a forest ranger. Inspired by the beauty of nature, she loved to write stories and poems in her native language and dreamed of becoming a writer. She finished Lviv business college and in 1992 immigrated to the United States with her two small daughters. In 2011 she started to pursue her childhood dreams, among them writing books for children. She is a member of SCBWI (Society of Children’s Book Writers and Illustrators), speaks several languages fluently, and loves reading, writing, gardening, and traveling. She lives in Smithville, New Jersey, with her husband, Patrick, and an adventurous cat named Nyda. Books by Mrs. D. include Carlo the Mouse on Vacation, The Trees Have Hearts, The City Kittens and The Old House Cat, Good Morning, World! and Carlo the Mouse, Book 1: Too Many Rules for One Little Mouse. Her books are available in print on Amazon and Barnes & Noble, and as e-books for most popular e-devices. The full series of Carlo the Mouse and her new books, Runaway Clothes, The Mysterious Life Inside a Closet, Everyone Needs Someone: The Royal Palm, and three rhyming stories Who Is Most Important in the Fridge? are coming soon. For updates on Mrs. D.’s books, please visit her websites: www.mrsdbooks.net or www.mrsdbooks.com. Good Morning, World! by the mysterious Mrs. D, is a classic children's book. The illustrations were rendered superbly, in brilliant and vivid colors, by Eladziem. This is not another “A-B-C” book, or “1-2-3” learner. In fact, what this book teaches best is reading! I find it noteworthy that the text seems geared to an older audience than do the illustrations. That arrangement is ideal for when an older sibling wants to read to “the baby”. Mrs. D. has crafted a superb children’s book in Good Morning, World! The entire story revolves around Baby Thomas being pushed in his stroller by his grandfather through the local park. Baby Thomas is a very cheery, happy little boy, who shouts out a “Good Morning” to everything he sees, including the sun and clouds, trees and flowers, frogs and lizards, birds and puppies, joggers and mommies. Meanwhile, Grandpa is a disgraceful excuse for a grandfather. Rather than cherish time with his young grandson, he gripes about everything, even to the point of griping about things that aren’t even happening, such as the imaginary crocodiles sunning themselves along the trail! This book provides an exceptional opportunity for teaching children about attitudes and the choice each of us has to be happy or dismal. The vibrant, compelling illustrations perfectly complement this story, providing much opportunity for teaching numerous other facts, such as having the child find the frog, or the sun, or the flowers, or the ladybugs. 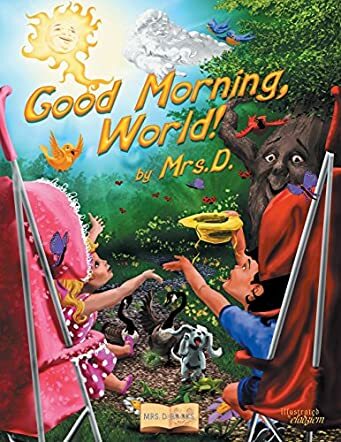 Mrs. D. and Eladziem work very well together, in producing an all-around great story book for stimulating young brains and teaching them concepts. Dear Lee. I would like to convey my heartfelt thanks for your great review and understanding the concept of my book. I am thankful in your review you recognized the real fact about the character of Grandpa. Children always have fun when they play with Grandpa, especially when Grandpa acts funny. This story was my observation of people and nature during my morning walks in the park. Unlike the Baby Thomas character, Grandpa’s character is based on the observation of many people over time. This story is a good remainder there is a beautiful world outside and we should often let our children interact with nature. Just like in old times… Thank you very much for this wonderful review, which brought much discussion. Good Morning,World! is a recipient of the prestigious Mom's Choice Award. The Mom's Choice Awards honors excellence in family-friendly media, products and services. An esteemed panel of judges includes education, media and other experts as well as parents, children, librarians, performing artists, producers, medical and business professionals, authors, scientists and others. When you look at the world, do you see it through rose-colored glasses? When you look at a glass of water, do you see a glass as half empty or half full? No matter what your age or perspective, you are sure to find a kindred spirit in Good Morning, World! by Mrs. D.
Good Morning, World! is a delightful children’s book about Baby Thomas and his Grandpa – two individuals who see the world from a vastly different perspective! The contrast in their viewpoints is highlighted one beautiful sunny day when Grandma sends them to the park for a stroll. The positive perspective of the optimist is personified in exuberant Baby Thomas, who is excited by everything that he sees! Every creature, big and small, that Baby Thomas meets is his friend. Everything on his path, he greets with joy! By the end of his stroll, Baby Thomas has collected a cap-ful of memories! Good Morning, World! is educational without being didactic – but lines like “The sun is very hot! It feels like a boiling pot!” are only half the fun. Eladziem perfectly captures the essence of this story with her emotive illustrations! I loved pouring over the details in every picture. Grandpa’s and Baby Thomas’s expressions speak a thousand words! Good Morning, World! is a book that you will enjoy reading to your children – and your young readers will enjoy reading on their own! It’s a book that makes you feel happy inside. I have read Good Morning, World! several times since its arrival for the sheer joy of it! All of nature outside of Baby Thomas’ window is singing the praises of the day, and Baby Thomas wants to join in the chorus. But Grandpa is tired, and unhappy that he is the one who has to push the stroller to the park. Baby Thomas pays no attention to Grandpa’s grumblings, as he greets all of the wonders around him. The sky, the sun, the clouds and the trees, animals, insects, and happy people all return his smiles. It is a day of wonder for the little boy. Not so for Grandpa, who finds the trip almost unendurable. The sun’s too hot, the wind’s too… windy, and the animals and insects are pests. Too bad for him, because when they finally arrive home, he still has only the grumpy disposition he left the house with earlier. However, Baby Thomas has a hatful of happy memories. How soon we forget the simple pleasures of everyday life. This book points up the joy a little child can find in what we adults would consider the mundane. In our day-to-day hustle and bustle, we take for granted the things that are around us, instead of focusing in on the little things that make life so beautiful. This is not only a terrific book to read to a toddler, with its beautifully-drawn pictures, but it is a gentle reminder to adults: to step away from our own little universes once in awhile, and see the world through the eyes of a child. Every one of Mrs. D.’s books have been a joy to read. Bravo once again, and keep writing!